Durable and economical, ceramic tiles are often found in kitchens, bathrooms and even exterior sitting areas such as patios. Manufacturers use several materials to make ceramic tiles. Most of these materials are common and contribute to the low cost as well as the longevity of ceramic tiles. Ceramics are made from different base materials, depending on their application. Most home-use ceramics have clay as a base. The clay is mixed with binding and coloring agents, then superheated to cause the ingredients to semi-crystallize. The result is a durable, heat-resistant structure. Very strong ceramic has a base not of clay, but instead of silicon carbide or nitride-bonded silicon carbide. These ceramics are used in areas exposed to extremely high temperatures such as kilns, ovens and metallurgical workstations. Of course, heated clay is heat- and wear-resistant, but the bonding agent added into the mix when making ceramic ensures uniform durability and appearance. Minerals that bind ceramics include silicon oxide, magnesium oxide and zinc oxide. These materials mix with the clay or silicon base, strengthening the molecular structure of the ceramic. High-temperature ceramics use nitrogen bonding elements. In traditional ceramics, the various shades of coloring, or glaze, available are not created simply by pigments but also by minerals. Minerals featured in ceramics include nickel and cobalt, which are used in creating an indigo glaze; copper and manganese, used in violet; iron and chromium, for pink and brown glazes; and even uranium, which is used along with iron, copper and cobalt in black glazes. 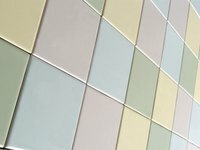 Several other materials are also used in various proprietary and traditional methods of creating ceramic tiles. These materials include minerals and elements such as borides, phosphides, selenides, tellurides and silicides. Each of these interacts with the ceramic in a different way, strengthening the overall structure, adding translucence and luster, and increasing its porosity or lowering its liquid-absorption rate.